You'll be £16.99 closer to your next £10.00 credit when you purchase Constant Vigilance. What's this? Order within the next 13 minutes to get your order processed the next working day! The RAF Regiment was created in the early years of World War II for the active dedicated defence of RAF airfields and installations. This books concerns the Regiments operational history in South-east Asia Command and draws on the diaries and recollections of the men who served in that theatre. It is strongly supported by maps and diagrams from official records. The Regiment played a vital and significant role in the two major battles for Burma, Imphal and Meiktila. The struggle at Imphal ranks alongside Stalingrad and Alamein in its significance for the defeat of the Axis. From humble beginnings, the Regiment in Burma had by 1945 become a highly-trained specialist ground force capable of defensive and offensive action. The successes of the 14th Army were founded on the support of the transport, fighter and bomber squadrons. The RAF could not have done this as effectively without the confidence that its airfields and vital installations were safe under the constant vigilance of the RAF Regiment. 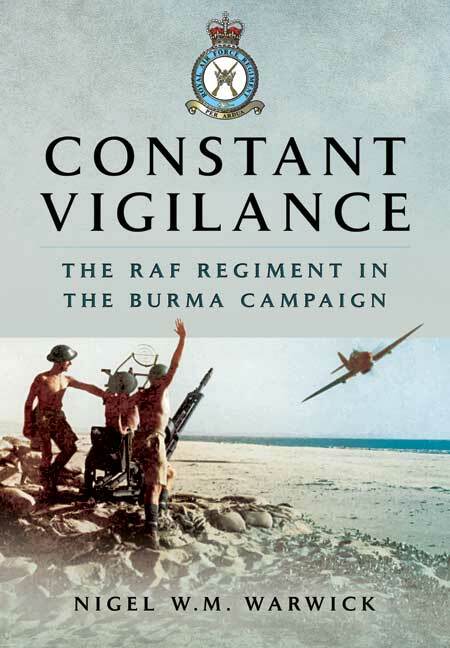 A very welcome new book and a fitting memorial to those who served in the RAF Regiment of the Far East. Strongly recommended. Dr Nigel Warwick has written the definitive history of the Regiment in South-East Asia Command from 1942 to 1945 by skilfully linking official documents with personal experiences to produce a vivid and readable account of what has often been described as a forgotten war. His book is a major contribution to the record of the Regiment's wartime history and deserves to be studied by all members of the Corps, whether serving or retired, to appreciate how much their predecessors achieved in what was probably the most demanding operational theatre of the Second World War. It is highly recommended as an outstanding example of what a military history should be.